HFS recommends these resources for protecting your digital privacy. Deleting documents or emails does NOT permanently remove the from you hard drive. AVG's PC Tuneup software ensures that the files, emails and browsing history that you delete are permanently gone and no longer accessible to ANY third party,period. PC Tuneup includes disk wiping and recycle bin shredding features that are as simple and easy to use as the anti-virus software that AVG is famous for. With a few clicks you can be sure that the files, emails and browsing history you've deleted are really gone, forever. Keep your surfing private so that NO ONE - even your ISP - has a record of your internet usage. PROXIFY - Connect securely to an insecure Web. When you surf the Web, every website you visit, every file you download, every chat room and online forum you enter is recorded. 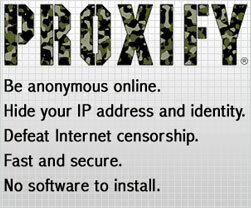 The only way to ensure that you online activity is private is by taking action. The Internet and electronic mail are inherently insecure Protect yourself - surf and send email without giving up your privacy. CryptoHippie lets you surf the web anonymously, safely and secretly, with no tracks left behind on your computer. Stop ANYONE from seeing what websites you visit and the files you download. communication private and secure Click here and get a Free Trial of CryptoHippie.